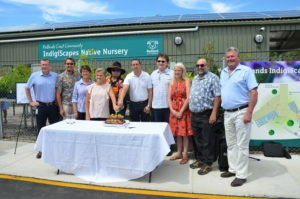 Redlands IndigiScapes’ new nursery welcomed hundreds of visitors on Saturday 19 January when Redland City Council opened the native plant facility to the community. The new nursery completes the first stage of a multi-million dollar project, jointly funded by Redland City Council and the Queensland Government, to upgrade and expand Redlands IndigiScapes Centre. The official opening saw elected representatives, locals, visitors and volunteers celebrate with activities that included children’s seed bomb craft, a seed propagation demonstration, free barbecue and other entertainment. Mayor Karen Williams said the new nursery was a welcome enhancement for Redlands Coast and would continue to educate the community about the use of native plant species, and host monthly plant days and annual ‘trees for weeds’ swap days. “The IndigiScapes nursery also plays a significant role in propagating local native plant stock for Redland City Council’s conservation plantings across Redlands Coast,” Cr Williams said. Councillor for Capalaba (Division 7) Murray Elliott said the opening event also gave community members the opportunity to learn more about the refurbishment works planned for IndigiScapes. “The stage two works about to begin will include a refurbished entry way, relocating the centre’s café and building a new theatrette with conference facilities,” he said. “There will also be a new environmental interpretation area so people can discover more about the wildlife and native plants of Redlands Coast and learn simple things we can all do to protect them. “These exciting enhancements will cement IndigiScapes’ place among the most unique and popular environment centres in Queensland, and we are looking forward to sharing the ‘new look’ IndigiScapes with the Redlands Coast community in coming months. Cr Williams said the new nursery would remain open during stage two construction works and provide the community with access to the display gardens. “People will also still be able to access our extension programs from their temporary home at Capalaba Place in Noeleen Street,” she said. Cr Williams urged residents and visitors to seek out new ways to explore the ‘wild’ side of Redlands Coast during the Centre’s reconstruction. “This is a great opportunity for people to explore other naturally wonderful locations on Redlands Coast, such as Black Swamp Wetlands and Venman’s National Park – just head to the Redlands Coast website for inspiration,” she said. For more details on the refurbishment project, visit Council’s website. Mayor Karen Williams, Member for Capalaba Don Brown, Member for Redlands Kim Richards and Uncle Norm Enoch are joined by Redland City Councillors Paul Golle, Paul Bishop, Wendy Boglary, Lance Hewlett, Mark Edwards and Murray Elliott at the official opening of the new Redlands Coast Community IndigiScapes Native Nursery. Posted in Community, Council, Environment, Events and tagged .